With another weekend of league matchups set in the books, we are going to take a look at all the action that took place in the Atlantic North divisions. The current league leaders, Old Blue, went up against their arch enemy NYAC in a New York rivalry this weekend. Old Blue entered this match at 4-0 and looked to continue their winning ways against a stingy NYAC team who lost narrowly against Old Blue last match, 36-34. This match was highly anticipated, but Old Blue struck first and never looked back with the final score 58-5. In the other division I matchup this weekend, Life took on Mystic River in a highly touted affair. Both teams showed some strong defense, but eventually Life took the lead in the 25th minute and showed a stronger defense leading to their 31-0 victory. Mystic River looks to rebound next week against NYAC and Old Blue will take on Life. Looking to bounce back after last weeks close loss, Charlotte took on Boston but this matchup was all Boston. Boston scored first in the 6th minute and continued their offense attack putting up a finals score of 45 and holding Charlotte to 0. Philadelphia was coming into this week 2-0 and was looking to extend their win streak against the Raleigh Venom, and that they did. Philadelphia won this competition by a score of 27-12. Next week the Venom look to rebound against a tough Boston team and in the other matchup Albany will take on Northern Virginia. Starting off in the Empire Men's Division II New Jersey division, Morris defeated Monmouth 28-12. Montclair won sizable against Princeton 74-14. In the final matchup for this division, the Union County Mudturtles defeated the Bayonne Bombers 27-16. Shifting to the Empire New York division, the Fairfield Yankees defeated their opponent Lansdowne 57-14. New York Rugby defeated foe Old Blue by a score of 28-17. And for the last matchup in this division, New Haven downed their opponent White Plains by a score of 46-14. Bumping over to the Great Lakes division, the Rochester Aardvarks defeated the Syracuse Charger 26-12. In a Buffalo rivalry, Buffalo defeated South Buffalo sizably, 60-19. And in the only matchup for the New England division, Newport won decisively over the Albany Knickerbockers, 57-0. In the Empire division, Uticuse held on to a close margin victory over the Rochester Renegades 45-37. Brooklyn Rugby also won out a tight matchup against Monmouth 14-7. By way of forfeit, New Haven got the victory 20-0. Moving over to the New England division, Burlington defeated Amoskeag by a score of 29-7. The Hartford Wild Roses defeated their opponent North Shore rugby, 83-5. In a much closer matchup, Worcester downed Portland 31-24. Upper Valley vs. Providence ended in a convincing 63-0 Providence win. To start things off in the Empire New Jersey/Long Island division, Suffolk Bull Moose downed Morris 56-5. North Jersey defeated Union County 43-15. Jumping to the New York City division, New York Rugby squeezed out a close one to Old Maroon, 28-24. The Gotham Knights handed a loss to their counterparts Brooklyn rugby by a score of 47-22. Moving over to the New York/Connecticut division, the Danbury Mad Hatter prevailed in a close matchup against Saratoga, 17-15. Greenwich continued its strong play this weekend, winning 36-14 against the Fairfield Yankees. Heading over to the Upstate division, in another battle for Buffalo, Buffalo rugby defeated South Buffalo 50-15. The Ken-ton Misfits defeated the Southtown Saxons 41-5. The Binghamton Barbarians won sizable against the Genesee Creamers 29-3. The Rochester Cardinals handed a rough loss to the Rochester Aardvarks 53-19. For our final division, the New England division. 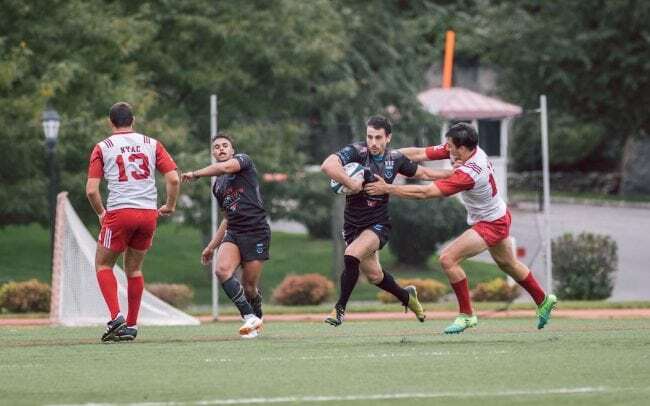 Boston Maccabi had an easy victory this weekend against Old Gold Rugby, 84-5. North Shore also had a decisive victory over Freedom Rugby, 59-15. New London County won against Mad River/Stowe 40-21. MIT Rugby defeated the Upper Valley Mountain Men 50-12. The Charles River Rats handed a convincing loss to the Springfield Riffles 46-19. And keeping in the large margin victory, the final game between Providence and Burlington resulted in a Providence victory by the score of 59-14.